A small clarification on the “fratricidal court politics” which indeed took place as four successive regents attempted to govern Scotland during the childhood of King James VI (later also James I of England). All this happened between the abdication or “dismission” which his mother Mary Queen of Scots was forced to sign while imprisoned at Lochleven in 1567 (shortly after his first birthday), and his fully taking over the reins of government in 1583. By the time Mary Queen of Scots was put on capital trial in England in 1586, James himself (now 20 years of age) had to decide on Scotland’s reaction. 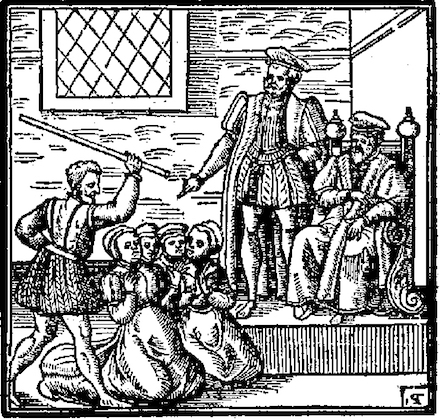 The commission which tried Mary and found her guilty of knowing and assenting to the Babington Plot to assassinate Queen Elizabeth — with very dubious legality in trying and condemning a sovereign monarch, as noted by Melisende as author of Mary’s Executed Today page — made it a point to emphasize that their verdict in no way implicated James or prejudiced his right to succeed Elizabeth, which would indeed happen some 16 years later. James made diplomatic attempts to intercede on his mother’s behalf for clemency, but after her execution on 8 February 1587, at which she expressed her desire for concord and a peaceful union of the two realms, he generally sought to keep a policy of amity with Elizabeth. When he became King James I of England as well as King James VI of Scotland in 1603, that union was effected.